Chandelure's official artwork from Pokémon Black and White. Chandelure (シャンデラ, Chandela) is a creature from the Pokémon series. 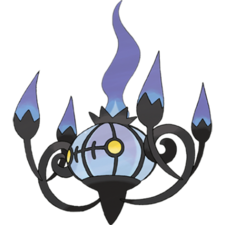 Chandelure is a Ghost/Fire-type Pokémon introduced in Generation V, and is categorized within the Pokédex at #609 as the "Luring Pokémon". It is the final form of Litwick and evolves from Lampent with a Dusk Stone. It is notable for being used by two different Elite Four members throughout the games, the first being Shauntal and the second being Malva. One of its possible abilities is Flash Fire, the likely cause of its fire immunity in Smash Run: when a Pokémon with it is hit by a Fire-type attack it receives a 50% power boost to its Fire-type attacks instead of taking damage. Fire Spin is a special Fire-type move introduced in Generation I. It damages and traps its target, preventing it from fleeing or being switched and dealing damage at the end of every turn. Chandelure can only learn it as a Litwick at level 7. Will-O-Wisp is a status move introduced in Generation III. It has 85% accuracy and inflicts the Burn status on its target if successful. Chandelure can learn it as a Litwick at level 16 or using TM61. Chandelure using Will-O-Wisp in Smash Run. Will-O-Wisp: creates three purple flames and shoots them at the player. Fire Spin: creates a flaming vortex which chases the player. If hit by any flame or darkness attack, whether direct, indirect, or terrain-induced, Chandelure receives a power boost to its next attack instead of taking damage or even flinching. The stronger or more attacks it takes before attacking, the stronger and larger the attack will be. Chandelure trophy in for 3DS. A Ghost/Fire-type Pokémon that burns its opponents' spirits instead of their bodies. When it attacks, it does so in bursts of three, using moves like Will-O-Wisp and Fire Spin. Try not to use fire-based attacks or items on it, as it will only absorb them and use them to strengthen itself. A Ghost- and Fire-type Pokémon that doesn't burn its opponents' bodies, but their spirits. When it attacks, it does so in bursts of three, using moves like Will-O-Wisp and Fire Spin. Try not to use fire-based attacks or items on it, as it will only absorb them and use them to strengthen itself. Chandelure appears as a Spirit for the game's Spirit mode. Chandelure absorbs Zelda's Din's Fire. A powered-up Chandelure using Fire Spin. Chandelure is immune to darkness-based attacks despite being weak to both Ghost and Dark type moves in the mainline games.